Professor R.John Ellis, an Emeritus in the School of Life Sciences, has been honoured in the Biochemical Society's annual Awards. The awards recognise scientists for the excellence of their work and the impact it has had within the bioscience community and wider society. 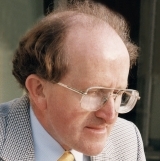 Professor Ellis will be presented with the 2019 Centenary Award for his pioneering research on molecular chaperones and their role in protein folding.